The task of Named Entity Recognition (NER) allows to identify proper names as well as temporal and numeric expressions, in an open-domain text. 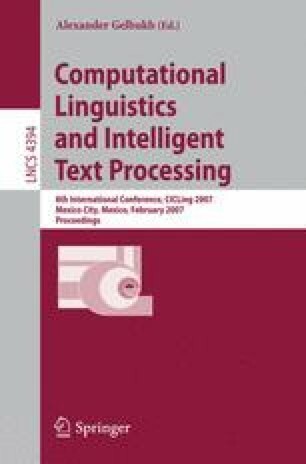 NER systems proved to be very important for many tasks in Natural Language Processing (NLP) such as Information Retrieval and Question Answering tasks. Unfortunately, the main efforts to build reliable NER systems for the Arabic language have been made in a commercial frame and the approach used as well as the accuracy of the performance are not known. In this paper, we present ANERsys: a NER system built exclusively for Arabic texts based-on n-grams and maximum entropy. Furthermore, we present both the specific Arabic language dependent heuristic and the gazetteers we used to boost our system. We developed our own training and test corpora (ANERcorp) and gazetteers (ANERgazet) to train, evaluate and boost the implemented technique. A major effort was conducted to make sure all the experiments are carried out in the same framework of the CONLL 2002 conference. We carried out several experiments and the preliminary results showed that this approach allows to tackle successfully the problem of NER for the Arabic language.